Go hard or go home: Unquestionably masculine and powerful, Hummer cologne for men is a rugged, woodsy scent for the man who swings for the fences. Introduced in 2004 by Hummer, this casual, moderate fragrance is great for evenings out with a romantic partner or for a day hanging out with your buddies. It features a complex and intriguing balance of cardamom, green leaves, thyme, patchouli, leather, peppercorns, amber, sandalwood and tonka beans, making it perfect for all occasions. I came across Hummer because a friend of mine wears it, he could not find it. It's his all time favorite. I love it too. I got it for him, I am so glad I found it. He is very happy. 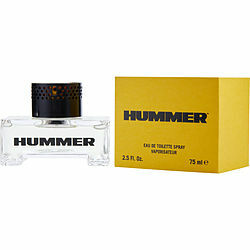 I just love Hummer cologne I wear it just about everyday... I'm always asked what's the name of the cologne you're wearing. Hummer is an outstanding fragrance for the guy who wants to smell as good as he looks. You can be confident that when you walk past the ladies they will notice you, Great price for a great fragrance..